How many times have you gone to your key cabinet and found keys missing and then found there is no record of who has taken them? If this sounds familiar have you ever thought of Intelligent Key management! Landwell’s latest RFID Intelligent key management system’s cabinets fully automate the process of managing your keys and provides a full audit trail of user activity when connected to its management software. The key tracking systems cabinets are available with 12 or 48 keys capacities, with the local access terminal capable of managing up to 200 keys. Each terminal can also be networked back to the management software via a LAN/WAN allowing very large key management systems to be created. 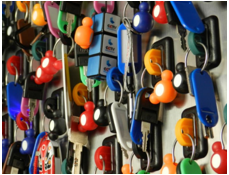 The Intelligent Key Management Systems use the latest RFID technology to identify each set of keys by using a lockable RFID key holder. Users can be identified by using an RFID card or their fingerprint. The system administrator simply enrolls the user on the system and specifies which keys they can use and at what times of the day or week they can be removed. The operator simply identifies themselves at the cabinet by presenting their card or finger, they select the key location they want to use and if they have the necessary permissions the cabinet door will open and the designated key will illuminate. On return of the key the operator simply presents the lockable RFID key holder and the cabinet door will open and the slot where the key needs to be returned to will illuminate. As this process is going on the system generates an audit log at the computer that details the time and date a specific key was removed or returned with the operator’s name. Please contact us for a detailed quotation about key tracking management systems.